House Speaker John Boehner of Ohio arrives for a news conference in Washington on Thursday, where he reflected on the stunning primary defeat of Majority Leader Eric Cantor. President Obama’s approval rating is stuck in the low 40s. That’s as low — if not lower — than it was four years ago, when Democrats sustained massive midterm losses. Republicans have a good chance to take the Senate and are very likely to keep control of the House, but they’re not running away with the 2014 midterm elections. Democrats remain even among likely voters on the generic congressional ballot, a key measure of the national political environment. How is that possible? Well, Republicans control the House of Representatives, and Congress is super unpopular. On Monday, Gallup reported that Congress’s approval rating is just 16 percent. That matches other polling data, and if that level of support holds through November, it would be the lowest heading into any midterm on record. What we’re left with is two unpopular entities — Obama and Congress — somewhat offsetting each other, leading to a national environment (as measured by the generic congressional ballot) in which neither party has that great of an edge. To see this effect, I examined congressional and presidential approval ratings since 1974 (the first year Gallup asked about congressional approval ratings). I only looked at those years in which the House was controlled by one party and the White House by another, as is the case this year. 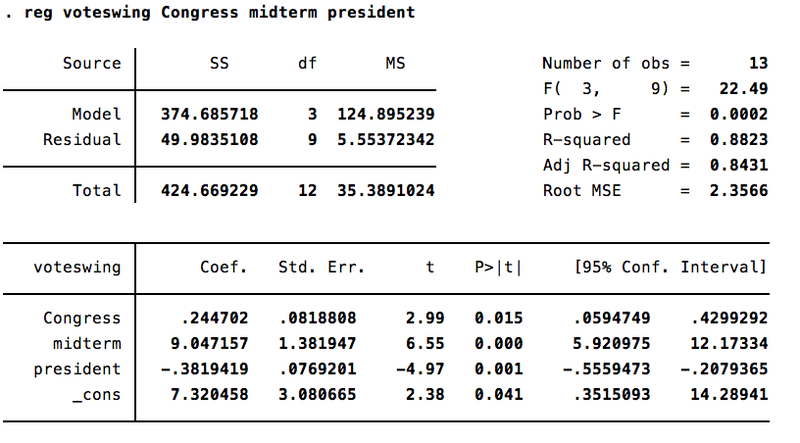 I’ve also controlled for whether the election is taking place in a midterm year; past research by political scientists shows the president’s party does worse in midterm elections than in the same national environment during a presidential year. Given this data, here’s what the model indicates best explains prior elections based on average congressional approval and average presidential approval in the second quarter (April, May and June) of an election year. Not surprisingly, the midterm penalty and presidential approval rating variables are most important in predicting the swing in the House vote compared to the prior election. 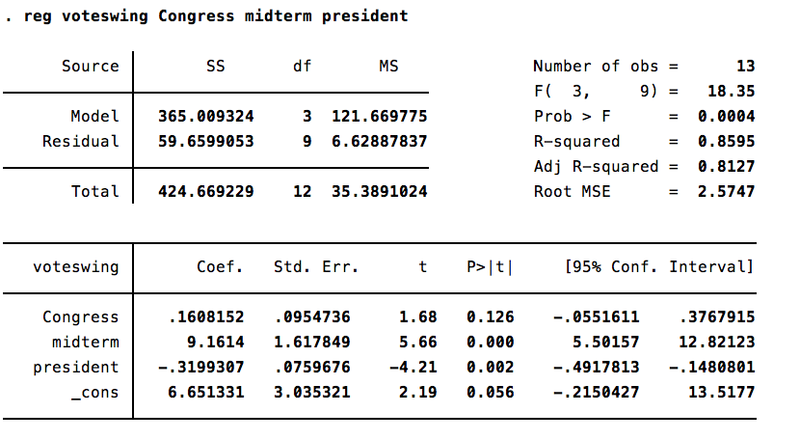 Both are statistically significant (see the p-value (“P>t”), less than 0.05 is good) and substantively significant (see the coefficient for “president” and “midterm”; further away from zero means there’s more of a relationship). The party in charge of the House does far better in midterms than it would do in a presidential election. 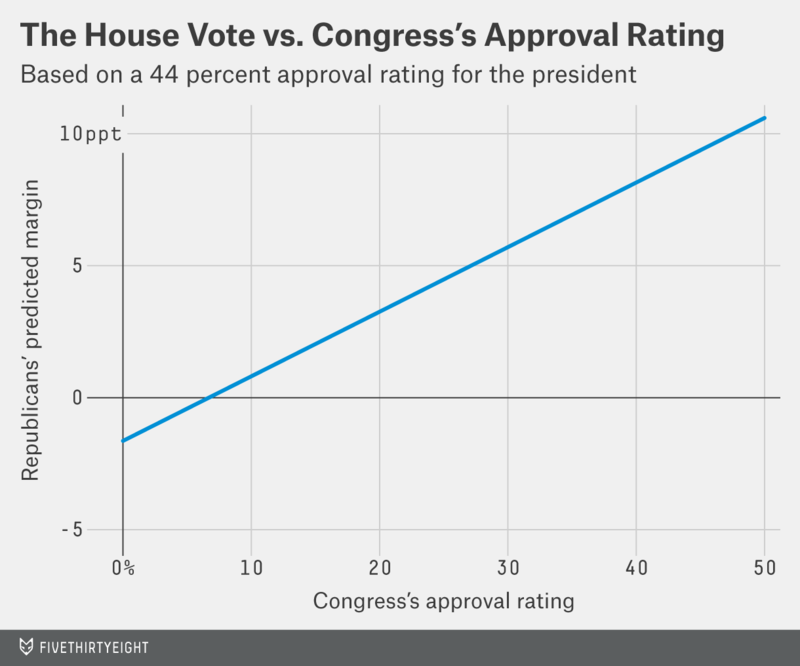 The party in charge of the House also does worse when the president’s approval rating is higher. Congressional approval ratings in the second quarter (see the variable “Congress”) are not statistically significant as defined above, but they are substantively significant. The lack of statistical significance is partly caused by the small number of observations we have in our data set, just 13 elections. Also, the president’s approval ratings effect is greater than that of Congress’s approval rating. Still, a congressional approval rating that matched the average of our data set, 34.7 percentage points, would predict a Republican victory of 6.1 points in the national House vote, which is 3 points higher than the actual prediction given a 16 percent congressional approval rating. Note that both of these estimates are greater than the current Republican lead on the generic ballot. This matches my earlier finding that the national environment tends to move against the president’s party as the midterm election year proceeds. We can perform the same test on approval ratings just before the election. (For this set, I took an average of the final pre-election approval ratings for Gerald Ford and Richard M. Nixon in 1974, because they probably both had an impact on the midterms). Here, the relationship between congressional approval ratings and the election result is stronger. If Congress’s approval rating this year matched the average of our data set, we’d expect Republicans to win the national popular vote by their 2010 margin (given Obama’s current approval rating). It would be a horrible national environment for Democrats. A 16 percent congressional approval rating, on the other hand, yields a prediction of a Republican win of just over 2 percentage points in the national House vote. That’s not good news for Democrats, but it’s far better than 2010. It also matches generally what we are seeing on the generic congressional ballot. I wouldn’t, however, take any of these exact estimates too literally; we’re only dealing with 13 data points. Yet the effect of Congress’s approval rating seems very real. Republicans look like they could be hurt by that low approval rating. This flies in the face of the idea that this or any election with split control is solely a referenda on the president.